It’s firing time again here at Tye River Pottery. We preheated the kiln for a week this time around. Preheat is a time to keep the fire slowly burning, catch up on your reading, or finish that pesky knitting project. We fire twice a year, allowing for a five-month throwing cycle and a month for loading, firing, and unloading. I thought six months between firings would drag on, but the time has flown by! My second firing as apprentice here at Tye River Pottery took place this last weekend. Our kiln has three chambers. There is an anagama chamber in the front, a climbing-style wood chamber, followed by a salted chamber at the end. The back two chambers are loaded in about a week, while Kevin takes his sweet time loading the front or ‘tube’ chamber. When it’s the fire that paints the pots, the loading is when the potter makes the surface compositional choices. Each region of the kiln has its own climate when it comes to reduction, ash, and flame speed. Kevin has spent the last 19 firings exploring the personality of this kiln. The kiln is cooling now from its twentieth firing. Last weekend the pottery was swarming with firing crew members and other curious peoples all eager to help with the 5-day firing. We need many hands to stack and stoke the 7 cords of wood burned in the firing. And what a fabulous crew it is! 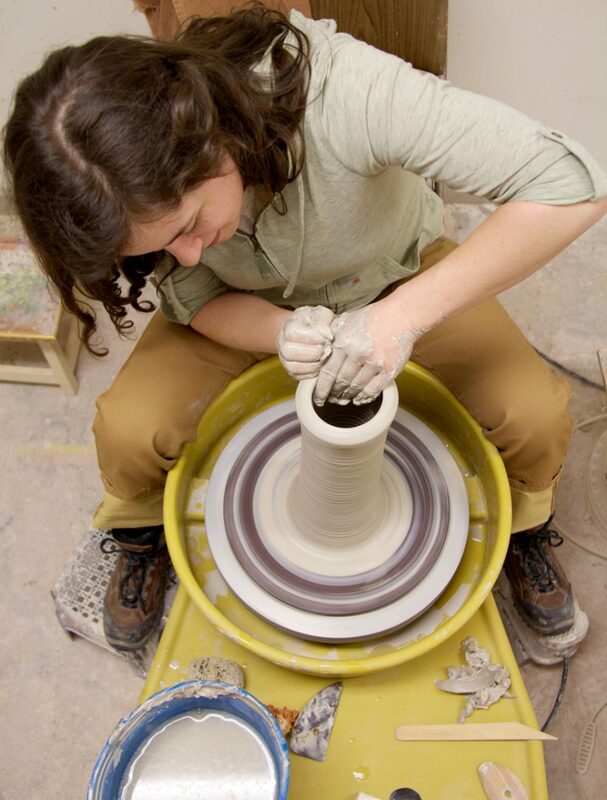 We have a dedicated firing crew including potters from Hinckley Pottery in D.C., the Piedmont Virginia Community College in Charlottesville, and the Brambelton Center in Roanoke. They swoop in on the Thursday of the firing weekend and sign up for six-hour firing shifts. Stoking the kiln, moving wood, and feeding the crowd is a round-the-clock task. I learned so much from observing the way these experienced stokers thought about the combustion cycle, fed the fire, passed the wood, and talked about their journeys in clay. Everyone has pots in the kiln, a devotion to the wood-fire aesthetic, and a love of great food. What a pleasure it was to fire with them! And now, we wait. 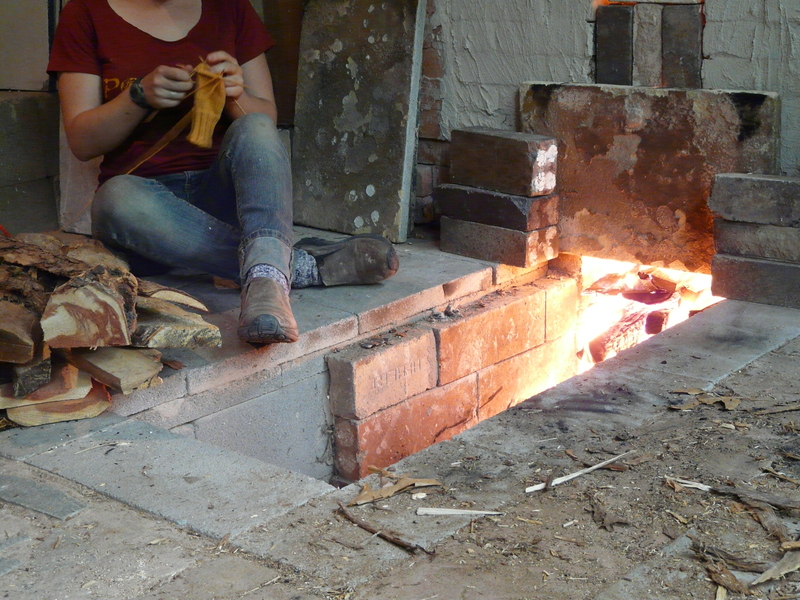 After a week of cooling, we will open the kiln on Saturday. Unloading the spoils of a big firing like this one, with anywhere between 1200 and 1500 pots, is something like a pottery Christmas morning. Until then, I’ll be circling like a vulture, sweeping and tidying the kiln area, while resisting the urge to peek. What a sweet suspense.